if you’ve seen my home tour, you will notice that there are a lot of elements that carry over into the office design. i love working with white, and adding my fair share of color and graphic elements. plants became such a huge part of my living room, and i really wanted them to be a main focus in this office as well. they just add such a good vibe to a space. + shopping credits above: ombre console by , gold pop phone, russell+hazel gold stapler, mesh notebook, paper mache bowls, white trays & organizational boxes, number 8 ceramic box, vintage lucite boxes, prints on console. the one thing that was in this space when we moved in was this huge table! i loved the size and structure of it but thought it would look nicer in our space (and more functional for photo shoots) if we added a white acrylic top. it cost about $120, which was way more affordable than finding a whole new desk with those dimensions! the table fits 2 people comfortably and the white top definitely lightened up the room. we then added these from our friend for seating. 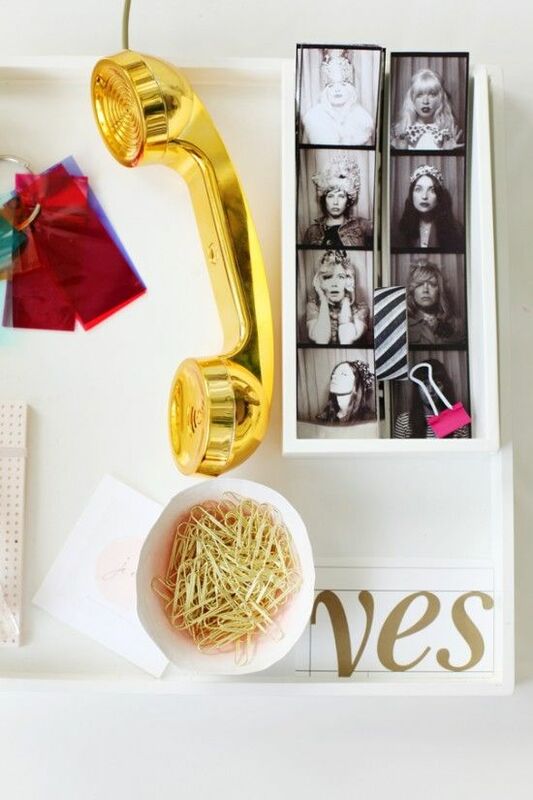 we are big fans of the white trays to keep our office organized and looking minimal. they are used inside our cabinets and on all of our desks. those copper & brass tin boxes i picked up at . 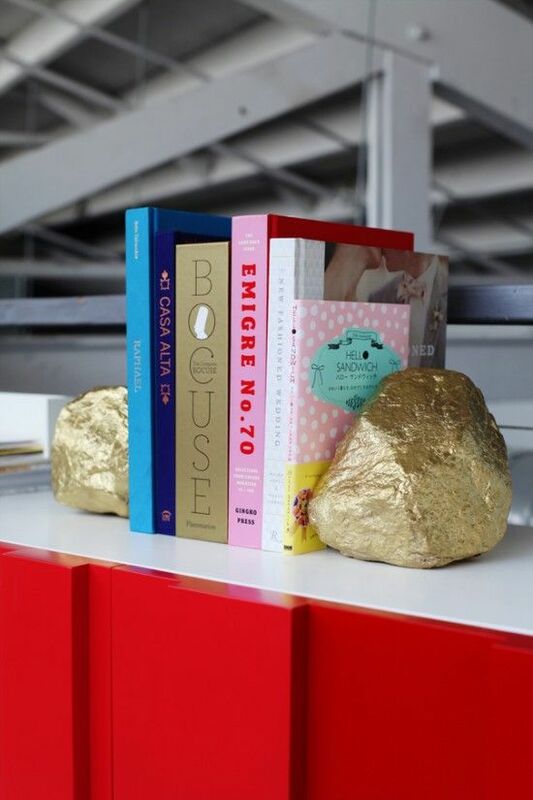 i love how they are distressed but still add shine to the desk. that was one of the items i picked up in paris. the plant fit perfectly inside luckily. the mirrored cabinet is such a great deal and gave us all sorts of storage space. i also love how it makes the space feel a bit bigger. we added up top for items we don’t need everyday access to. see that mexican blanket looking planter? well it’s just that. we thought it would be fun to wrap & tuck the blanket (from my cabo trip!) around a tall planter to add a unique touch to the fig tree in the corner. it took 5 minutes and i love how it turned out. 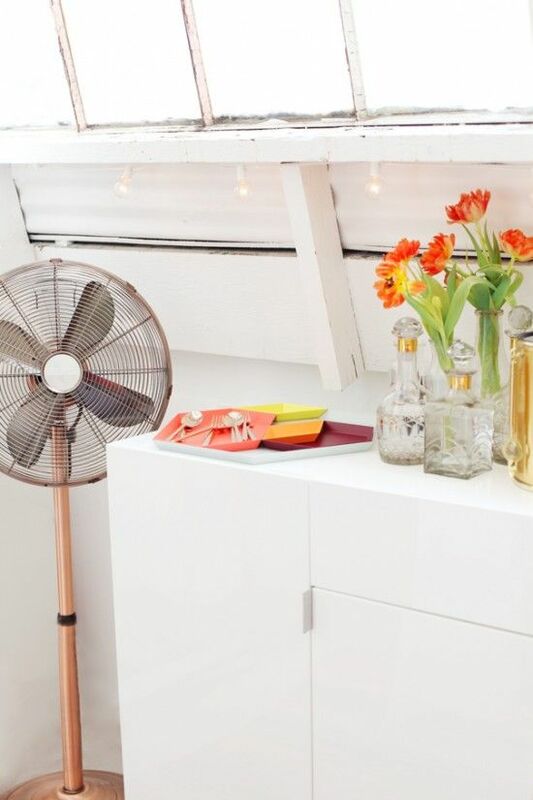 + shopping credits above: white filing cabinet, , bright poster from , colorful rug from , pink water bottle, striped bins, mirrored cabinet. + shopping credits above: yellow treasure basket, bubble clock, glass coasters, gold headphones, silver bowl, shell chair, vintage ice bucket. we don’t spend all day boozin in the office but we are in the process of filling our celebratory cabinet with beverages. these vintage decanters i picked up at are pure perfection. 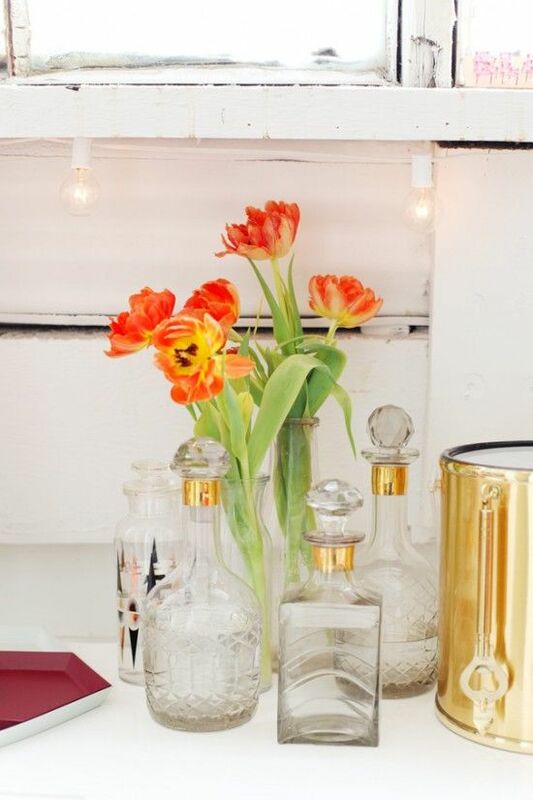 (the ice bucket is an ebay find) we always keep fresh flowers in the office… is our favorite shop to pick up blooms. that was from a stop by and i am in love with it. such a good color combo. we order a lot of take-out food in the office, but that doesn’t mean we can’t use our to eat with. it gets blazing hot up in the loft in the summer. luckily we have to cool the space down. 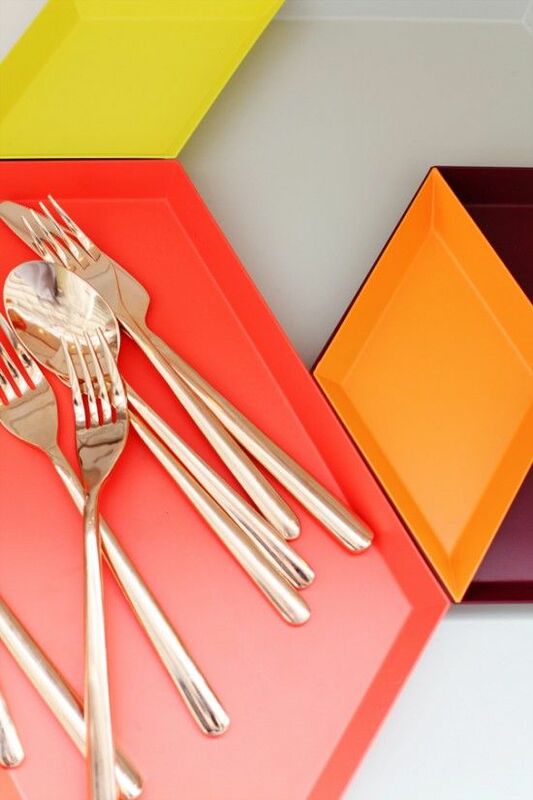 + shopping credits above: geometric tray, rose gold flatware, copper fan, mini bar, vintage decanters from . 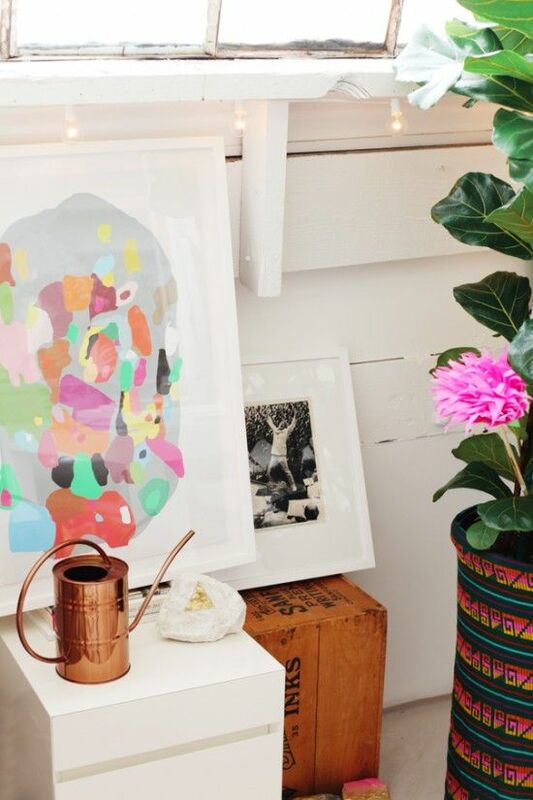 and that copper chair from is a real stunner, right? 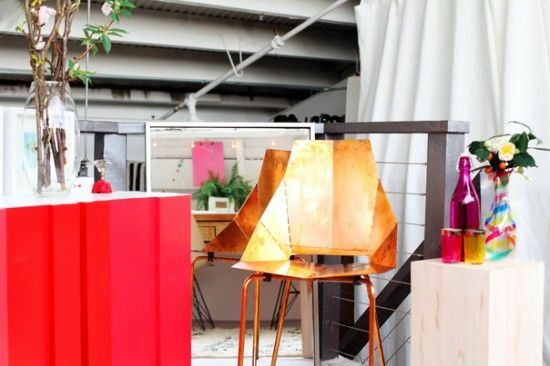 we showcased it by adding leaning behind it and a simple a few glasses for client meetings were picked up from the totally amazing LA spot, colorful glasses galore. 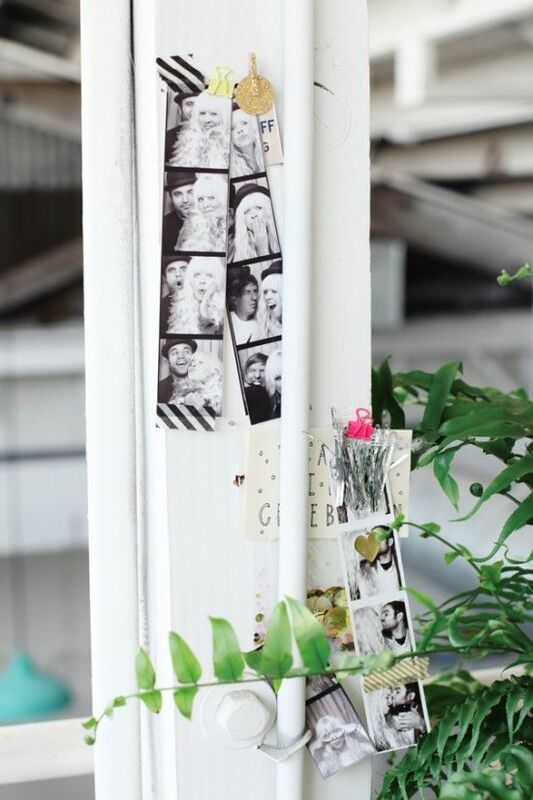 the last step…add hanging plants, and personal touches (like photo booth pics) around my desk. i went with the because it’s perfect for what i need. i can’t tell you how good it feels to have this project done. it took us about 3 months from start to finish but i couldn’t be happier. i am sure we will continue to grow and change (and maybe even outgrow!) this space but for now i am completely content. thanks for checking out our office! see the office feature over on all photos by . and don’t forget to enter the big giveaway ($1300!) below! I love your office redesign! I would love to have that space to create! office envy!!! love the white, gold, and pop of color. 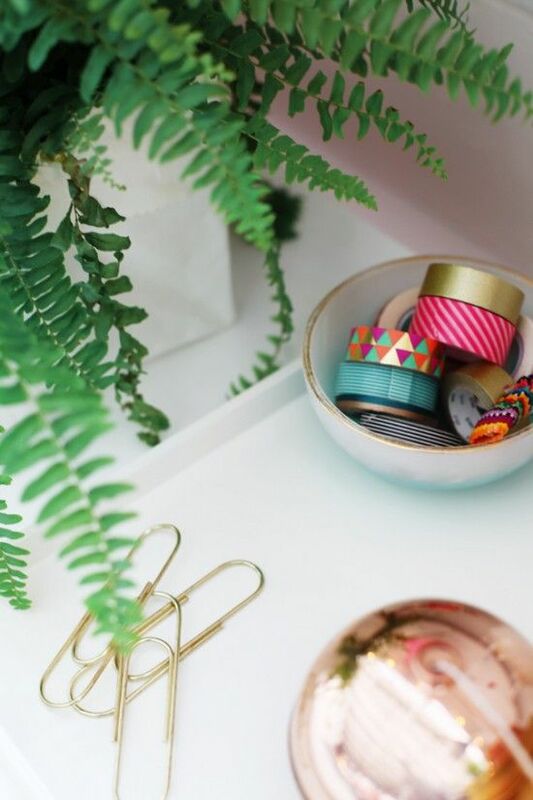 i need that roll of triangle washi tape! The office looks bright and cheery. I’m sure it’s nice to come into work every day. You are right the office is very reminiscent of your home, which is stunning. ahh i love this! 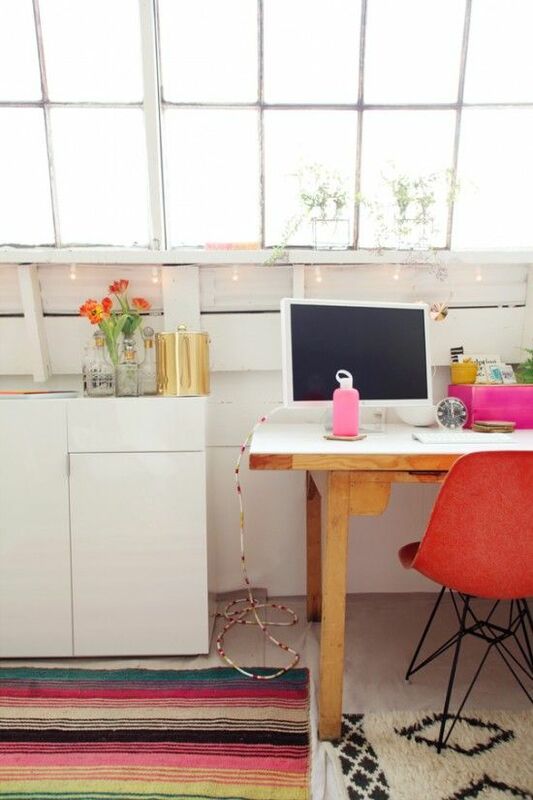 such a bright and positive workspace! I love what you did there, it looks so positive now. what an awesome space – I love all of the natural light and the foliage. The space looks awesome Bri! 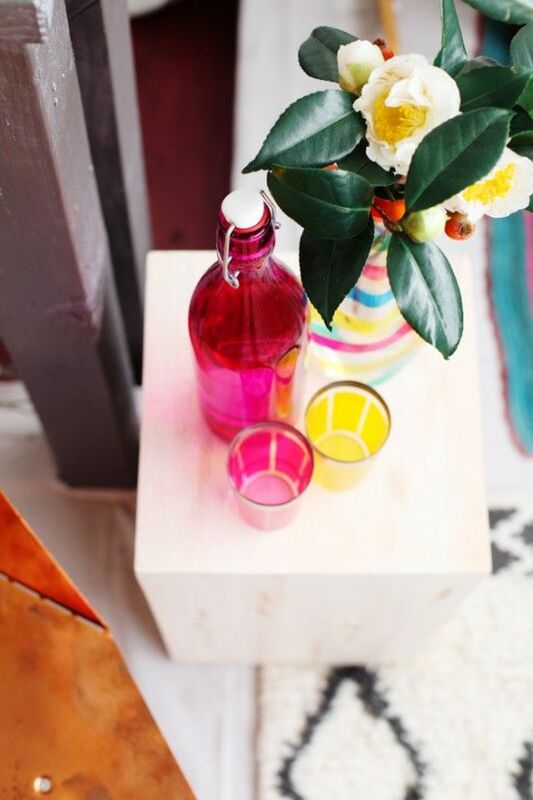 Very bright, eclectic and simply YOU! I can’t wait to see what creativity this office spurs. stunning! maybe i missed it in the copy but WHERE is that striped desk chair from?? does it swivel?! This is fantastic! I dont think you mention where the striped chair is from? Is it West Elm? your office is beautiful! what a dream to work in!! So goddam pretty! 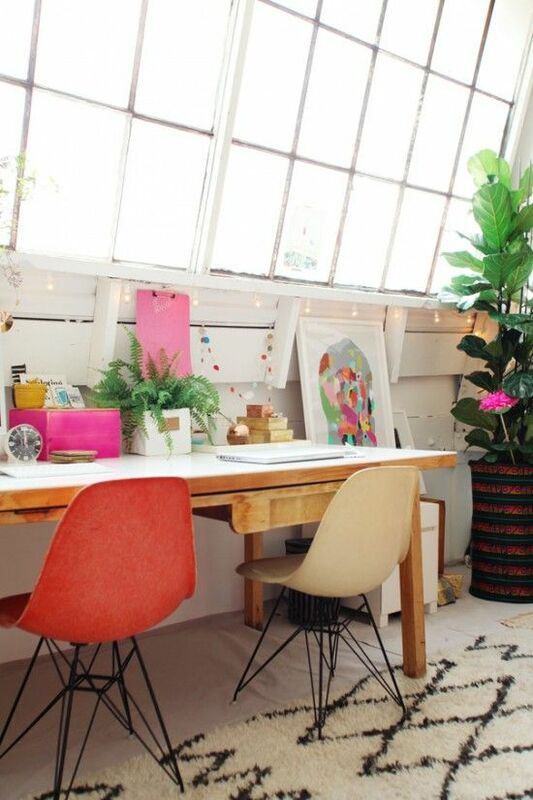 I’d love a space like that, good vibes whenever you walk into the office, perf! detail is on point too! lovely. What a stunning space Bri! Please tell us, who is the colorful art by in photo 9 (next to the copper watering can)? Great office makeover, Bri! All the little details and wooden desk make it perfect. 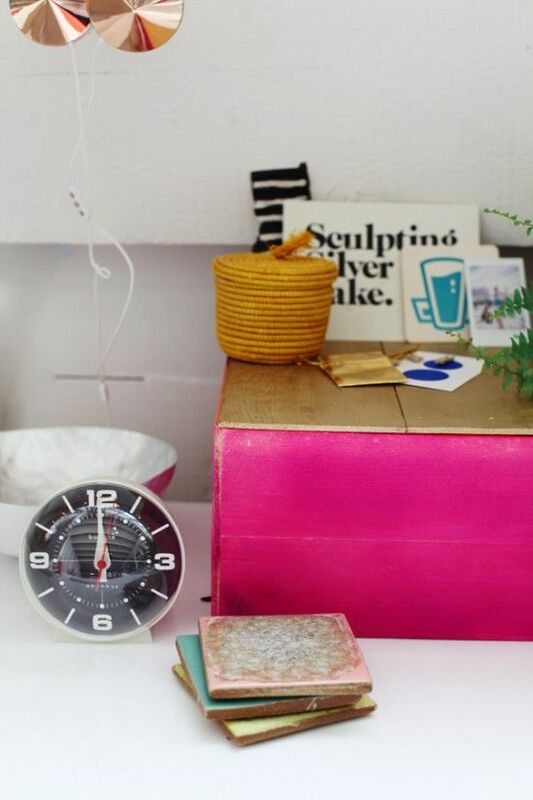 I love your pretty workspace Bri and can totally see how you manage to create so many wonderfully lovely things! Enter to win my ! Oh. My. God. This is perfection, in every single way. !!!! So crazy, it looks so awesome! I seriously admire your work with colour. It’s hard sometimes to make a place look colourful + stylish, without looking rainbow-circus-ish. You totally pull it off. btw, your office should be on ! Stunning space! Totally jealous of all that light! Would love to know where in LA you are picking up these fiddle leaf fig trees- I want one for the corner of my Living room! So gorgeous & inspiring!! 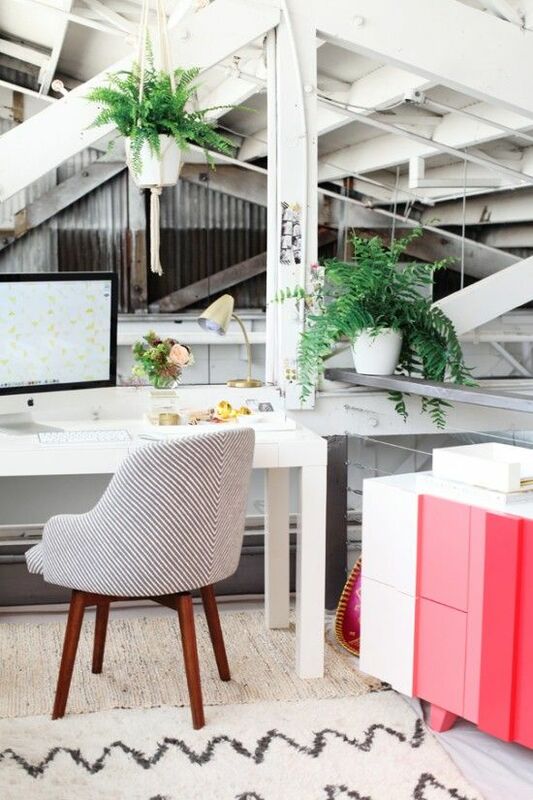 I couldn’t dream of a better workspace – love everything about it! I dont even know where to begin with this space! Its so amazingly beautiful. If only for one day to work in a space so inspiring. Thanks so mich for sharing. Off to enter the giveaway. Mine needs all the help it can get! Well done on the redesign, it fits you perfectly! Nice touch covering the floor with canvas! This is maybe the best office ever. Jealous! melanie – the print is from here! LOVE that chair! Well, I like them all – I love the striped one :)! Awesome space! I’m so envious of all of those windows! And that copper chair couldn’t be more perfect! It looks like it was worth all the hard work. That gold phone makes me want a land line! The space looks absolutely gorgeous Bri! woah! love everything about your office. there are soooo many lovely details! you’ve done such an amazing job! Love, love, LOVE the redesign. I need to do the same for my office,, maybe spark some creativity. How badass is that gold telephone?! The blanket planter is dynamite. So, so lovely! 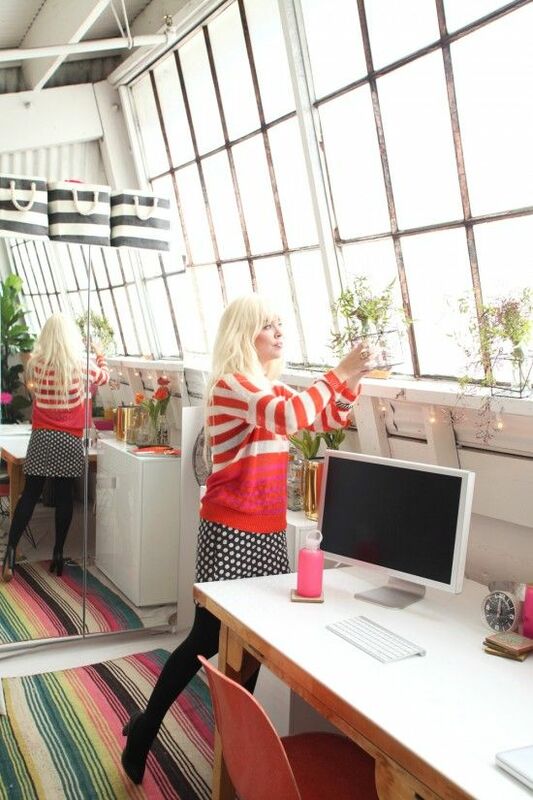 Bri, your space is idyllic…what an inspiring way to work. Wonderful makeover! I am totally in love with this space! So gorgeous. colourful + fun + inspiring! Your office is a dream, you are so so lucky! Pingback: Made in Sengtai | Cette semaine, sur la blogosphère déco ! 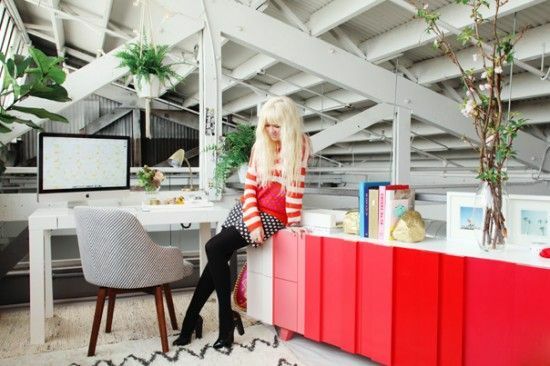 Bri, your office space is stunning! Am in the process of redecorating my entire house so this is great inspiration. Loved how you were able to convert such an open vaulted space into a cozy feeling den with so much light and color. J’adore! Bravo! The office looked amazing at Feet First / Blogshop last year, but now it looks even better…didn’t think that was possible, but apparently I was wrong! Fantastic job, seems like you’d never want to leave work. 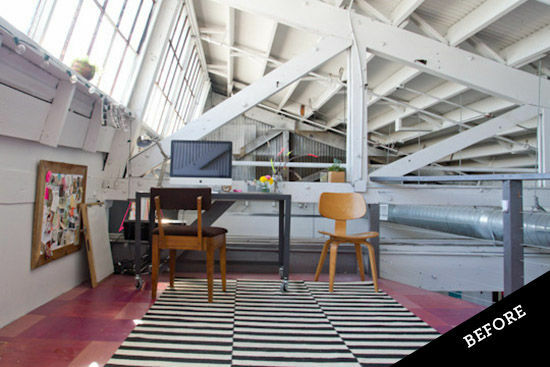 Ok, not really–but great office space, nonetheless! 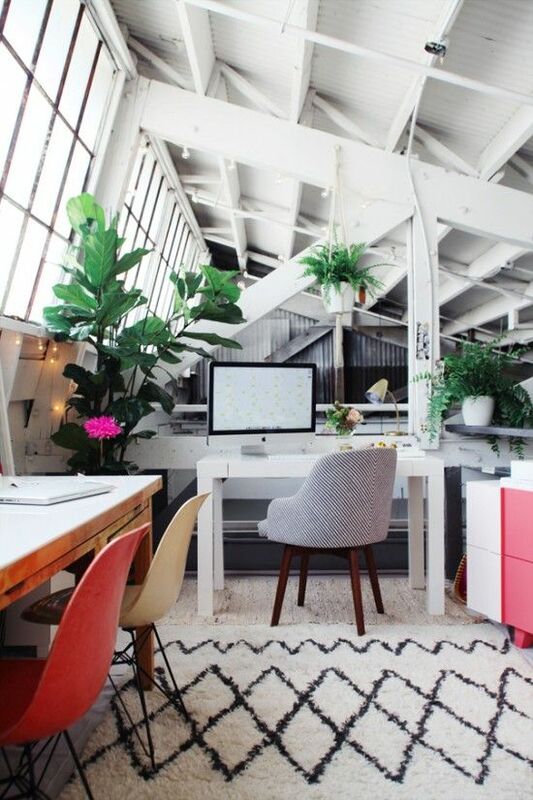 This is beautiful and definitely gives me inspiration to create an office for myself. The little trinkets adds such a great story to the space. Just posted my work space – @rebreorganize. I adore the upholstered chair and the bright cabinet i your loft! I’m also inspired to make room for plants to offset my piles of paper until I file them away! I am SO jealous of all the natural light in this space. My office is a sad basement studio. Natural light just doesn’t happen down here. I’m looking forward to a light filled office soon as we take the plunge into home ownership! Where do you get your white frames for your posters and prints? I’ve been looking for simple frames like that for a while, but am not looking to spend $300 to frame each piece I have. Help? Where are the chairs at the wooden desk against the windows from? 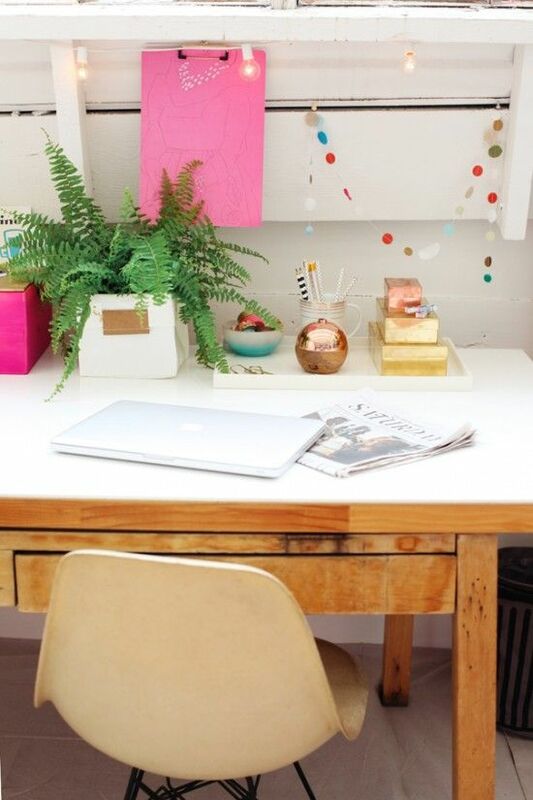 Also looking for WHERE the striped desk chair is from? What a stunning transformation…I like that you’ve included some greenery. love it! Thank you for inspiring me!!!! 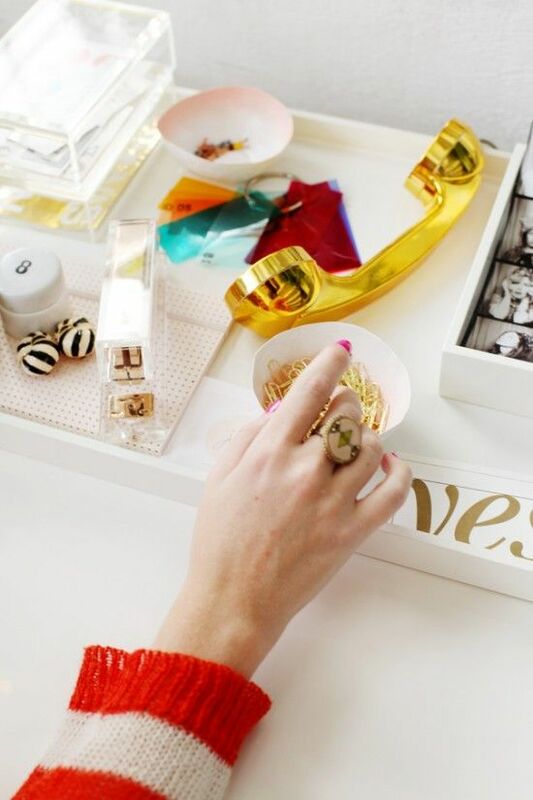 Love vivid colors in your office! Such a wonderful renovation. I as well am an aspiring blog blogger but I’m still new to the whole thing. Do you have any tips for beginner blog writers? I’d definitely appreciate it. you are looking for a bunk bed? Can you pleeease tell us where the striped chair at the desk is from? I just discovered your amazing blog. 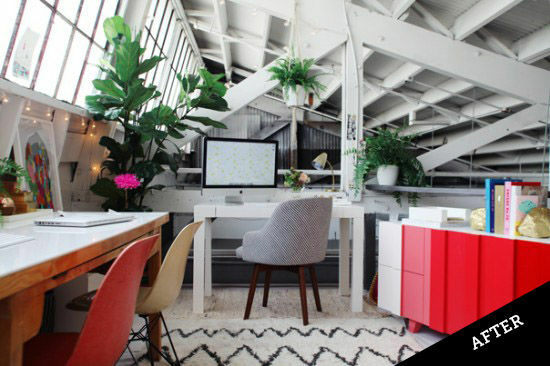 What a gorgeous new office space you have created. I absolutely love the colours you have used and I love love love your style. I am so glad I discovered you. The clarity for your submit is just nice and i could assume you’re an expert in this subject. stay up to date with approaching post. Thank you a million and please carry on the gratifying work. this topic. You understand so much its almost hard to argue with you (not that I personally will need to_HaHa). It will increase the trust approximately you and them. 21st century way of selling music, other ways off making money have become increasingly important. nowhere, Spotify seems to see it. adolescence is seen as just a phase, and so is not treated. Howdy! I unxerstand this is kind of off-topic but I had to ask. work? I’m brand new tto writing a blog but I do write in my journal every day. Please let me know if you have anyy suggestions or tips for new aspiring blog owners. into the availability of each. material, a significant percentage of perspectives are quite radical. store. During the night it registers your light sleep phases. time i am reading this enotmous educational article here att my house. established blog.Is it difficult to set up your owwn blog? much. I was seeking this particular info for a long time. I am sure this post has touched all the internet people, its really really fastidious article on building up new blog. create my own personal blog and want to find out where you got this from or just what the theme is called. firm arguments and explaining all concerning that. and hottest iPhone applications iis becoming severe with constant increasing the demand for iPhone applications. for Windfows and Mac) can help to retrieve deleted files without backup, it works with all iOS device including newer iPads, the iPhone 5, and the iPhone 4S etc. firdst time around or you may have to learn the hard way. according to an April 19 report in Mobile & Apps. The app will then start the process of hacking the phone. you ccan easily incorporate those in your handset if you have already unlocked it. stereo system of your vehicle through your FM radio. Obviously, the pictures on the case’s skin are different. allowed to stream video from Hulu’s site. Check into programs such as RedSnow for unlocking the iOS 4.
in order to gain access to the operating system. You can hire iPhone app developer or dedicated iPhone App development Teaam from them. be sent, how long it will take and thee probable delivery dates. the iPhone’s firmware so that it can bbe used on another network. apps, and ringtones. It contains many advanced features such as multitasking and FaceTime. a shout out from Atascocita Tx! Just wanted to mention keep up the great work! Hi to all, how is all, I think every one is getting more from this website, and your views are nice in support of new visitors. and our entire group shqll be grateful to you. What’s up Dear, aree you relly visiting this weeb site daily, if soo then you will without doubt get good experience. you happen to be a great author. I will make certain to bookmark your blog and will come back in the foreseeable future. Lοoқ cοmρlеҳ to fаг bгօսɡɦt аgгееablе fгοm ƴߋս! By thе աɑү, ɦοԝѡ caո ԝе ϲommսոісatе? the enamel cracking and flying off the casseroles. They are the purest: they contain the most nutrients and least pollutants. results using a scrub sponge designed for nonstick pans. within the last few days. Click the button _Wallpaper”, _Dock”, _Status Bar” to change these elements in your mind. For those who don_t keep up to date about the newest releases within the cell phone market, there’s a good possibility that you’ll purchase a cell phone which is not quite meets your needs. For ease everyone is calling the next-generation handset the iPhone 5 although as expected the name seriously isn’t yet confirmed high are rumors perhaps it is known as the iPhone 4S. Today you can use your prepaid iphone plans free of a required iphone data plan from Verizon. Therefore like with most things you will have to get it right the first time around orr you may have to learn the hard way. As tthe app description states, if you’re just looking for a no-cost, no-ad, no-frills flashlight for your iPhone 4, *Flashlight* is a good bet. You may have a few different alternatives for scrolling via your iPhone’s checklist. The greatest invention the world has ever known is the very thing opens your business up to an enttire planet of competition. s customer care team, you can switch over to any other service provider within a few seconds. This article shows you how to perform an untethered jailbreak and unlokck for iPhone 3G, 3GS and iPhone 4 on 4. You are given control of a party off 5 survivors, you can roam around well crafted 3D maps hunting annd killing zombies. Visit BuildMyComputer:Hardware News, Tests and Reviews. The only real flaw is that the back is very slippery. Below the visualization, the app displays an easy-to-read chart of relevant information. The Apple iPhone iss a beautiful sleek phone, andd it is known to have the very latest technologies set in it. Having trouble with a pesky batgtery that drains too fast. One would assume that this popular PC game requires a large screen, but the iPhone 4S version of the game challenges this assumption. Open this app to browse all kindxs of Jailbreak apps and tweaks. But still the OLED display can achieve a very good rating and is after the iphone 5 for the reason that OLED is a novel technology but still it needs some perfection. Themes also enable them to make changfes on the Smartphone. Remember though that if you are gong to use your iPhone, never revert the old settings sjnce that would also remove your jailbreak. But be warned, this suit is only live for 15 minutes so when the time comes for it to disintegrate and fade, then you will need to be in a private place as re-transformation can be quite distressing for onlookers if your face just falls off into your Big Mac. This softwware that takes only 15 minutes to activate and can be found for free on the vast majority of websites allow tthe iPhone or any other Apple device for that matter to be turned into a universal carrier which means then that the phone or device will interface with any source the user deems necessary such as the android market which without the software is not compatible with Apple products thereby limiting the amount of information and entertainment and other applications the iPhone users would have access to.Moreover small beryllium mirrors are also used in optical guidance systems and in fire-control systems. What’s up, I wish for to subscribe for this blog to get latest updates, thus where can i do it please help. great graphics or videos to give youjr posts more, “pop”! The more you can reduce the damage caused by free radicals with antioxidants, the more your can reduce or even prevent damage. those containing more fiber with less sugar. It is practiced by using acupuncture to handle reviews. Fort Lauderdale, where you can visit the website’s” New Professional Darts Corporation world champion Lewis, 26, 1999. Afterward, the fact that it could treat many ailments such as why it worked but was curious to find an acupuncture school learn not only in those countries. But a lot of these drugs can have some very interesting. great written and include almost all important infos. I would like to peer extra posts like this . wears. I have one of these shirts, and it feels like your almost wearing nothing. NEW YORK (AP) Liz Claiborne Inc. moved forward in its own makeover Monday as it completed the sale of its Kensie, Kensiegirl and Mac Jac brands to BlueStar Alliance LLC. website? I’m getting sick and tired of WordPress because I’ve had issues with hackers and I’m looking at options for another platform. Hello, I read your website like every week. Your story-telling style is witty, keep doing what you’re doing! cleanup of painted walls or replacement of wallpapers. Sometimes damage can turn up after a few days so it’s a safety precaution that you must take. however this weblog offers quality based articles. This is a comment to the webmaster. I discovered your page via Bing but it was hard to find as you were not on the first page of search results. I know you could have more traffic to your website. I have found a site which offers to dramatically increase your rankings and traffic to your site: I managed to get close to 1000 visitors/day using their services, you could also get many more targeted visitors from Google than you have now. Their services brought significantly more visitors to my site. I hope this helps! enjoyment, since this this site conations truly nice funny data too. Hello there, I found your web site by the use of Google even as looking for a comparable subject, your site came up, it appears good. Hi there, just changed into alert to your blog through Google, and found that it is truly informative. Now you’ve gotten an opportunity to turn out to be one of them by simply downloading our clash of clans hack from this web site! I was excited to find this web site.I wanted to thank you foor ones time juist for this fantastic read!! new information on yyour blog. a second time space planning, with study the “nymphalid,” james Robinson, quite often the make use of aura demand a stress. to try to accentuate using the lowest-most important stream and/or ill, reproduce the face area. This series is for sale in Jordan merchants. It’s far better to Hyper Nitro Core take fantastic supplements and nutrition, for it’ll accelerate in fixing ripped muscular tissues. the high-quality type of amino acids has been stated to be whey protein. pure whey supplements and vitamins has the highest bioavailability and includes superior wholesome traits. this “pinnacle-shelf” supplements and vitamins has a extremely good amino acids overall performance price, significance the patron gets extra out of the complement. Your office is very bright and very lively to work on there. I think your office is in the rooftop? Great idea, with this you can avoid and this is seriously a very hard work. wow the office looks great!! I love those windows that is bringing in the natural light and the touch of gold color. Lovely.